The following Guest Blog by Daniel Court from Eltherm UK discusses the application of heated hose technology to the transportation of gases for analytic applications and their wider use for the transfer of fluids and vapours by high pressure heated hose. Throughout industry there exists the requirement to analyse gas emissions, whether it be from the chimney stack of a plant where fumes are generated (for example from incineration, power generation or chemical process), or in the automotive sector where rigorous testing of a new engine exhaust is required to ensure compliance against ever increasing environmental requirements. Often, the gas must be sampled at temperature, despite there being some distance between the point of exhaust and the physical location of the gas testing equipment. Video Playlist : Eltherm Heated Hoses for the flexible transportation of liquid and gas in both manufacturing, industrial and hazardous area locations. For all these applications, Eltherm have a wealth of experience in the design and manufacture of ELHa flexible heated hoses with working temperatures up to 450° Celsius. Moreover, a heated hose can be used to heat up, to prevent heat loss and to transport media, e.g. grease, oils, wax, resins, bitumen, varnish, water, carbon dioxide, foam plastics, casting compounds, glue, foodstuff etc. It is particularly important to keep these materials in a fluid state or to grant for specific treatment properties in a determined range of temperatures. 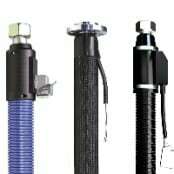 For these applications the heated hose is mostly laid on the mobile machine components (robots) and equipment. Analytical heated hoses can be produced in a range of different styles and inner diameters and to cater for temperatures up to 450°C. A common question asked is, “what is the maximum length a heated hose can be produced too”? Theoretically, it is equivalent to the maximum circuit length of the Eltherm heat tracing cable utilised, which often with analytical hoses is of the self-regulating type. Several self-regulating heating cables can be used at lengths in excess of 170 metres, however handling a heated hose of this length would be impractical. Certainly fitting it on a single drum for shipment is likely to be an unrealistic proposition. For this reason, the maximum hose length should be a subject discussed on a project by project basis – call us to discuss your heating application. Eltherm Heated Hose Design : optimum heating cable output on the carrier hose is achieved by using Eltherm standard hoses which are configured to include bifilar heating cables and special spacers. Creating spatial density in the hose that carries the heating cable ensures perfectly homogeneous heat distribution throughout the hose achieving optimum element loading. The additional glass-fibre spacer prevents hot spots in moving applications with greater bending strain, as contact between the heating cables is avoided. Eltherm ELHa analytic heated hoses are specified to provide reliable transfer of gases from the point of withdrawal to an analytic measuring device e.g. chimney, connection to a heated exhaust sample probe. Analytic heated hoses provide official and precise measurement of emission levels using heating cables optimised to maintain constant gas temperatures, prevent the formation of condensation or lowering the deviation of dew point. 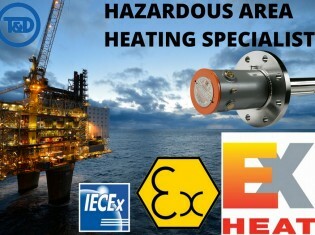 Temperatures can be maintained across 5 to 450 Degrees Celsius in both industrial and hazardous area classified zones. 2. 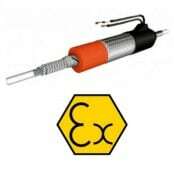 Sensor – temperature sensor is mounted between inner line and heating cable for temperature control. Eltherm PT-100 sensors can be integrated to customer specific temperature sensors including thermocouple type K / J, PT-1000). 3a. 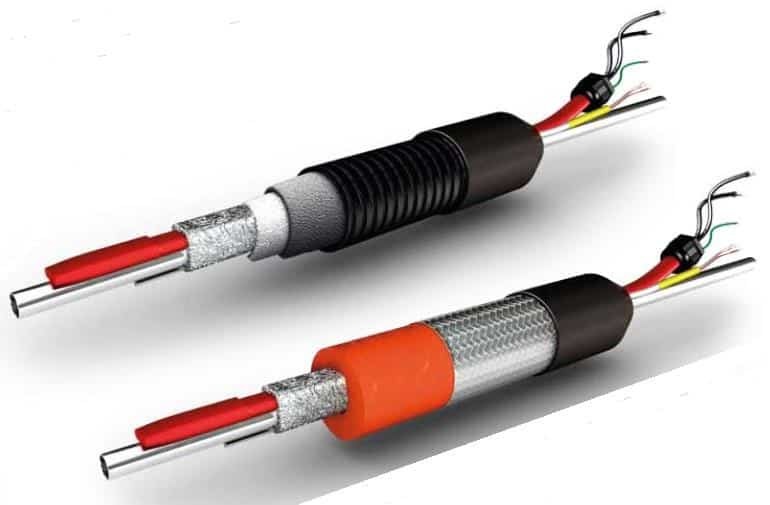 – Heating Cable – Eltherm ELKM-AE resistance heating cables insulated with flourpolymer jacket can maintain process heating temperatures up to 250 Degrees celsius. 3b. – Spacer – made of braided glass-fibre provides reliable protection for heating cables against damage and hot spots caused by cable bending strain. 4. Insulation – cable insulation depends on the maximum operating temperature and selection of hose outer jacket. General rule : special thermal fleece materials and foam hoses are used (up to 100 Degrees celsius) and elastomer foam hose (up to 250 Degrees celsius). 5. Outer Jacket – hose jacket is determined by the heating application, bending radius and ambient temperatures. The outer jacket provides heated hoses with reliable protection from humidity, weather, external environmental impact and mechanical strain. 6. End Caps -end caps are used to seal off heated hoses at both ends. 8. Connecting Cables – the connecting cable is led out separately (sensor cable and tracer cable). Connection cables up to 1.5m as standard. With the inclusion of a thermocouple or PT100 sensor in the heated hose, it is possible to very accurately regulate the temperature of the hose, regardless of its length and ensure that the gas sample neither heats nor cools as it travels from the source (for example chimney) to the test apparatus. It’s worth noting that heated hoses are in effect a modular trace heating system and that the considerations when designing a hose solution do not differ from that of a conventional trace heating scheme, with the exception of the handling considerations as detailed above. 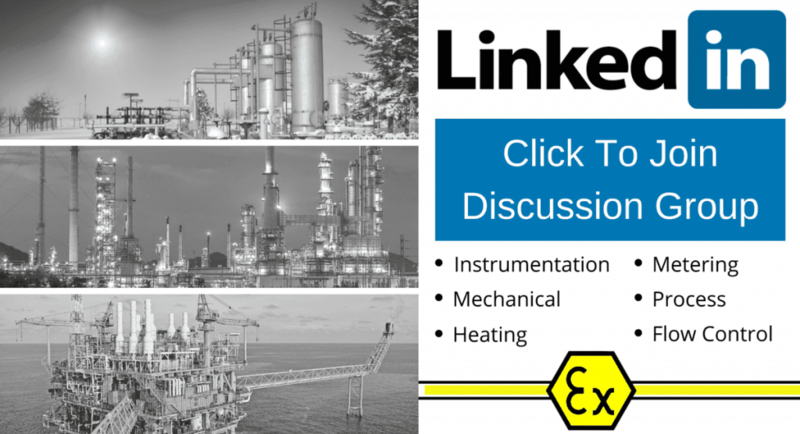 Key considerations include: target maintenance temperature, minimum ambient temperature, maximum temperature of the gas in flow (ie with respect to selecting suitably robust construction materials), supply voltage and ATEX hazardous area classification. As one of the world’s leading manufacturers of this type of heated hose, Eltherm are also able to offer highly customised variants, providing solutions for a practically unlimited range of applications. Designs can be produced to cater for special connectors and fittings, multiple carrier hoses, auxiliary wiring, custom wire harnesses and so on. In addition, the hoses can also have a range of outer coverings applied, ranging from nylon braiding through to a stainless steel heavy duty braid. Utilising the compact Eltherm ELTC-mini controller, it is also now possible to have electronic temperature control built in to the hose itself. Eltherm heated hoses for analytic gas applications are ATEX certified for transporting gases and liquids in potentially explosive atmospheres including hazardous area Zones 1 and 2 (gas) and Zones 21 and 22 (dust). Customised hazardous area heated hoses can be manufactured with process temperature ranges from +5 Degrees celsius frost protection (temperature class T6) to +200 Degrees celsius (temperature class T3). Typical applications include : process control, control systems, ventilation and air-conditioning monitoring, emission monitoring and. condensation prevention. 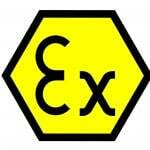 ATEX certified analytic heated hoses meet 94/4/EG (ATEX 100a) Ex Protection Directive. Stringent European and UK legislation imposes statutory limits on gaseous emissions to the atmosphere from industrial plant. Power generators must comply with the Large Combustion Plant Directive – LCPD (Directive 2001/80/EC download below), while incinerators of waste materials must comply with the Waste Incineration Directive – WID (Directive 2000/76/EC download below). Operators of power plant of greater than 50 MW capacity are required to measure SOx and NOx emissions continuously. 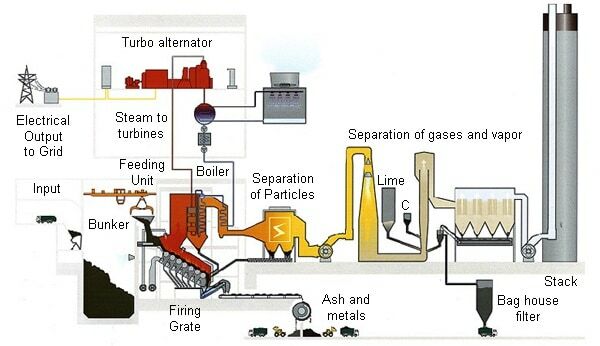 Operators of waste incinerators – which can range from small biomass plants of less than 5MW to large-scale municipal waste incinerators greater than 200MW – are required to measure the same gases and also typically CO, HCl, NH3, TOC and sometimes HF gas. The LCPD and WID directives place obligations on plant owners to ensure that CEMS are available for not less than 97 per cent of the time. Furthermore, owners of plant operating under WID are obliged to stop their processes – and therefore suffer a loss of revenue – if their CEMS fail for more than 4 hours. ISO and EN standards define the performance, reliability and maintenance requirements of the gas analysers in CEMS. These requirements are regulated in the UK by the Environment Agency (EA). BS EN 15267-1 (Air Quality – Certification Of Automated Measuring Systems) performance standard covers a range of emission levels for waste incineration, solvent-using processes and large combustion plant (including gas turbines). The general CEM requirements and performance standards to be met by CEMs for each characteristic are presented in Section 5 of the UK Environment Agency’s Performance Standards and Test Procedures for Continuous Emission Monitoring Systems (download below). Should you require any assistance with the selection, specification and purchase of analytic heated hose please to do not hesitate to contact T&D technical sales.